Driving in from Netaji Subhash airport to South Calcutta, in between posters of Konkona advertising real-estate, my eyes were assailed by gigantic cut-outs of the great King Khan, wearing KKR’s new purple jersey (tough luck to all the suckers who spent moolah buying their black jerseys), cut out of the same lingerie cloth as their old uniform but with a kinkier color, having the suitably pithy slogan “Luck De” (which I initially read as “Lick De”). Suitably seduced, I leaned back, closed my eyes and thought to myself—-Oh to be in India now that IPL is here. Front page of newspapers replaced by a gigantic advertisement for the tournament. IPL countdown clocks on every channel.The stench of money, greed and cheap thrills. So who will win the IPL? Its futile speculating and frankly I am not interested. Okay if you really want me to stick my head out, it should be Delhi Daredevils because very simply put, they have an overwhelmingly strong team, so strong that in the interests of fairness the fight should be stopped before it begins. Sehwag, Gambhir, Dilshan, Warner, De Villiers are five of the world’s best devastators and they are ALL in one team and could potentially play together. But then again, who really cares as to who wins except those who place the bets and those who carry home the prize money? I personally only care for one thing. And that is entertainment. What kind of entertainment? Let me explain. 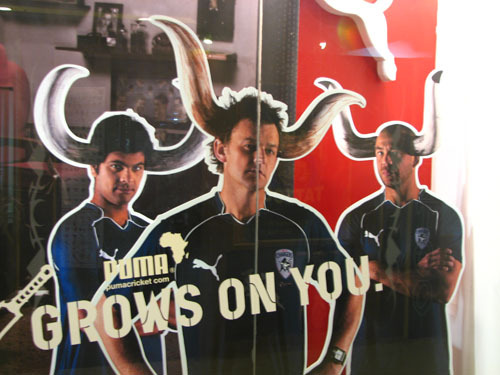 Now when I saw this (picture taken by Suhel) I think I understood the ostensible theme of the ad—badass men with charger-like horns you dont mess with, even if one them bowls at 125 Kmph nowadays. But what truly entertained me was the subtext—-I am “horny”. Yes. And while the horny angle is lost on Andrew Symonds, about whom those beautiful lines were penned in Dilli 6 “Humare pyar mein yeh bandar baan baithe”, who looks as usual angry and drunk, it is RP the Role Player with the bedroom eyes and the whole “My bowling is like my love-making style—slow, gentle and very compassionate” thing he has got going which makes me all weak in the knees. This is why I give Chargers my thumbs-up and I will definitely be behind them through the season. The team I am most disappointed in is the Bangalore Royal Challengers. In 2008, they regaled us with bald-pate-glistening I-have-no-clue-about-cricket-but-watch-my-lips-move Charu Sharma as the CEO, T20 superstar Wasim Jaffer galloping like a snail, old age home escapee Sunil Joshi out for a walk in the park and a red-faced maniacal owner. Since then, they have radically firmed up their act and look a very strong and balanced cricketing side with Manish Pandey, Virat Kohli and Morgan forming a crux of next-gen stars backed up by the experience of a Dravid, Kumble, Kallis, Boucher and by mid-career players like White, Taylor and Steyn at the top of their games. Which means there will be no room for Wasim Jaffer’s pyrotechnics or of the King of Good Times blowing his top. My favorite team of course, purely on the basis of the entertainment they provide, will remain the KKR. And I will be at the Eden come Sunday to support them against the Bangalore Royal Challengers. I will raise the slogan of “Amar lokkhi roton chele” (My darling gem of a boy) in the tremulous voice of a thakuma (grandmother) as Laxmi Ratan comes in to bowl. I shall roll my tongue around “Jol-e chul taja, tel-e chun taja, bench-e Mor Taja” (sorry no translation for non-Bong readers) as I try to spy with my right eye the world’s most highly paid benchwarmer. I shall shout till I go hoarse if (I hear he is injured) UnLucky Chikna Agarkar, his ears flopping in the breeze, comes in to bowl like a Santa Claus bearing gifts for the batsman. I shall snigger at the sight of Ishant Sharma, standing mid-pitch after being struck for a six, with the expression of a man whose pocket has been picked. Twice in one day. Will all this be worth the Rs 1200 I will shell out for my ticket—-around the same price one would pay, once upton a time, to watch 5 days of Test cricket? You should only write this kind of posts, you are not a specialists in political things and you become completely biased very often when you write about politics. 2nd only to third..actually a fifth..!! i too think the ticket prices are madly exorbitant. Passing thought: Instead of the whole IPL chutzpah last year, i enjoyed Fake IPL Player’s blogs truely. BTW are you in India these days? @Utsav: You are an idiot. “Amar lokkhi roton chele” baba-re…LOL and The IPL makes money even with all these joreks in tow… wooooooo hoooooooooooo India Rocks!!!!!!!!! Just relax.. 20-20 is totally by chance. Any team can win. May be this is KKR’s turn this time. if KKR win this time, we’ll know for sure that IPL is scripted. just think in 2008 – the team least likely to win, becomes champion. in 2009 – the teams that were bottom last year play finals and poetically last year’s bottom wins it. so in 2010 – most dramatic story wud be kkr winning it. and in 2011 – the finals will be between mumbai indians (owned by mukesh ambani) and ahmedabad cosmopolitans (which anil ambani will bid for and win)! Do you blame me for reading “Konkona advertising her real estate”!!! I think the desi ‘hawa and pani’ have brought back your sharp wit. Not that you’ve been missing it lately but this piece is very sharp in satire even by your standards. Non bengali readers might not enjoy to the same degree as I did because of your clever usage of the bangla sayings. 1) London se mangvaayi gayi goli…jisne ‘Gunda’ mein Chitiya ko mard bana dia tha…. 2) Replacing SRK with KRK (deshdrohi superstar) in KKR promotions. Here’s a snippet for you – IPL is now free to air in England, so more English cricket fans will have a chance to watch the IPL than the Ashes which are only available on paid sports channels! ticket nahin mila to hum PARTY HILAA DENGE!!!! every 5 minutes you can see this ad playing in one or the other channel…just too much…. Ishant’s WORLDS top rising cricketer to look forward to! Only a south indian team will win this time. Actually as most of good players are from south, we should all support for a south team win. Ipl is back and with it vintage Arnab is back. Agarkar as Santa Claus was priceless! You started this post in test mode. Then u came in one day form in middle and then you were in full flow in T20 style, massacring everything. When it was nearing perfection, you ended the post. Cruel. Hope it is just the starters for your ipl take. Extend your stay and give fakeiplplayer a run for money. Welcome to Kolkata, Greatbong. Hopefully, I will manage to sneak off early on 19th to Crosswords! I think, what Australian guy who coached Indian team said about Ganguly was right. LOL at you and Ganguly..
“Jol-e chul taja, tel-e chun taja, bench-e Mor Taja” 😀 😀 😀 …. Priceless!!! Hey man, I thought personal attacks were a strict no no on this blog ? “Agarkar ears flopping the breeze” What gives 😉 ? you’re on a roll.you’re writing very well these days. Had to travel to Bangalore at the last minute — had full intention of being in Delhi otherwise. Best of luck with the book. Have placed an order. I know I sound like some cranky old cantankerous guy complaining and cribbing about everything…but cant help it!! P.S. Sorry for so many comments! “T20 superstar Wasim Jaffer galloping like a snail”!!! HAHAHAHAHA!!!!!! 😀 ultimate!!! well i dono who is this guy http://www.realiplplayer2010.blogspot.com/ but he says he is real ipl player unlike fake one and he is in team. He posted couple of post also looks good. BREAKING NEWS: Kishor is back…. Now, the comments section would become more interesting! I love the way the camera now focuses on the giant screen for ads. I always thought that the time between the balls was wasted and was ripe to be filled with ads. PS: Kishore we love you man. yes i am stupid, like all the fyatarus. ‘Bench’e Mor Taaja’, now thats a classic! But for the anachronism issue, Satyajit Ray would have been glad to use the innovated version in Shakha-Prosakha! Totally demented. Keep it coming champ. BTW Ishant’s face is the kaleidoscope of stupid / idiotic expressions. He always need some Zaheer or other to mother him around. …he has got going which makes me all weak in the knees. This is why I give Chargers my thumbs-up and I will definitely be behind them through the season. hey GB, Freudian slip? Super! Agarkar’s ears, old-age home escapee, lokkhi roton chhele… All priceless.